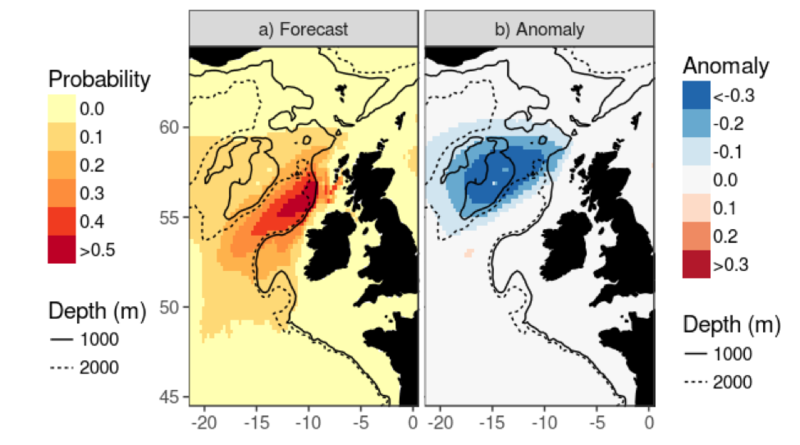 Home/Polar Prediction Matters / Allgemein / Cloudy with Passing Schools of Tuna – Why Don’t We Have Forecasts of Fish? Why we don’t have forecasts of fish? 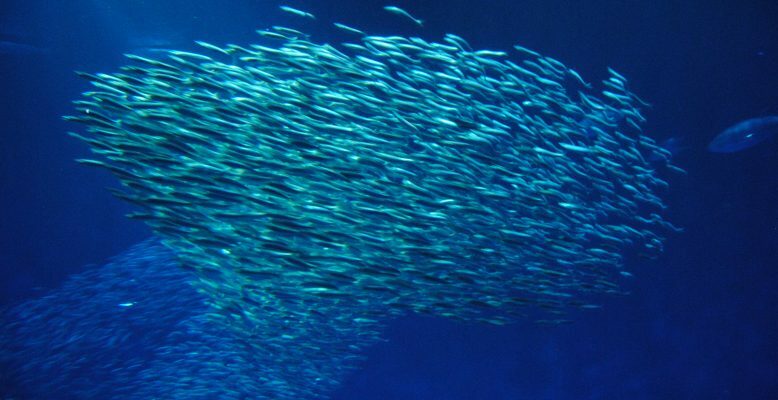 Passing school of Northern Anchovy at the Monterey Bay Aquarium, California (photo: Kirstin Werner). Weather forecasts have become such an integral part of our lives that we instantly recognize their language and structure, even when, as in this case, the nouns are replaced by something (seemingly) nonsensical. But is it that far-fetched? And have you ever considered why we don’t have forecasts of fish? There can be little doubt about the need for such forecasts. Most people have a sense that, much like farmers, fishers are highly dependent of the whims of nature: in some years, mother Earth provides a feast, in other years a famine, with seemingly little connection between the two. In some societies and communities, particularly in tropical countries, small island developing states (SIDS), and Arctic communities, the ocean provides a critical source of not just protein, but also employment, foreign revenue, micronutrients and cultural nourishment. If it were possible to foresee the fluctuations in these resources, these communities might be able to both plan for and adapt to the changing and variable nature of our planet. Fortunately, the last decade has seen a revolution in our ability to predict the state of the climate, and the ocean in particular. Compared to the atmosphere, changes in the ocean take place much more slowly and predictably (due to the high density of water), giving rise to the ability to make forecasts on much longer timescales. 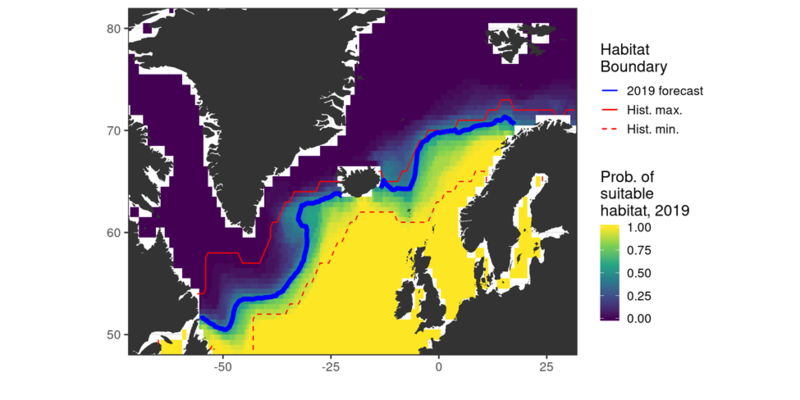 Whereas forecasts of conditions on land are measured in days, weeks and months into the future, in the ocean we can start to think about years: indeed, multi-annual-to-decadal forecasts of sea-surface temperature have already been demonstrated in the northern North Atlantic. Nevertheless, there are many challenges that remain before regular fish forecasts become a reality. New observations, better models and the regular production of forecasts are all required: the Year of Polar Prediction has an important role to play in advancing each of these elements. Similarly, within the Horizon 2020 project Blue Action, we are developing improved forecast systems based on an improved understanding of the links between the Arctic and lower-latitudes. Figure 2. Example of an ecological forecast product, showing the forecast spawning distribution for blue whiting (Micromesistius poutassou) in March 2018. Distribution is represented here as the probability of observing blue whiting larvae and is plotted as a) the value and b) the anomaly relative to the climatological probability (1960-2010). However, the critical bottlenecks to developing marine ecological forecasts currently lie further downstream. Marine biologists have yet to achieve the degree of mechanistic understanding and predictive capacity that their climate scientist colleagues are familiar with. Many complex and difficult-to-measure processes play into the dynamics of a species, including, for example, interactions between individuals of both the same species (e.g. competition, cannibalism) or between different species (e.g. predation). As a consequence, a predictive understanding of the relationship between the physical and biological environment remains difficult to achieve. Nevertheless, by working with what knowledge is available, researchers are starting to produce the first generation of forecast products of fish (Figure 1). The first of these products appeared a decade ago in Australia, forecasting the distribution of southern bluefin tuna. More recently, researchers in the United States have developed multiple products along the Pacific coast. Europe, however, lags behind these countries: it is only in the last year that first products have emerged, predicting the spatial distribution of blue whiting (Figure 2) and bluefin tuna (Figure 3) in the North Atlantic. To the best of our knowledge, there are no such forecast products being produced regularly that forecast living marine resources in the developing world, where ocean-dependency is highest and there is the greatest need for it. Figure 3. 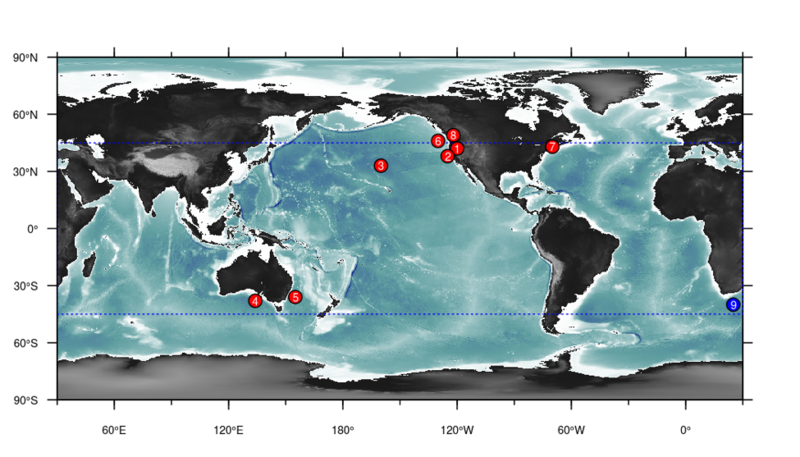 Bluefin tuna feeding habitat forecast in August 2019. For each pixel, the probability of the sea surface temperatures being thermally suitable for Atlantic bluefin tuna is estimated from the North American Multi-Model Ensemble (NMME). The contour line corresponding to a probability of 0.5, which has been used here to define the most likely limit of suitable habitat, is plotted as a heavy blue line, while the historical minimum and maximum habitat boundaries (1960-2015) are plotted as red lines. How can we improve this? Developing a successful forecast product is not just a question of forecast skill: indeed, there is a solid body of work that shows that the relationship between the skill and value of a forecast to the end-user is neither strong nor linear. Instead, developing a forecast requires striking the balance between what is scientifically feasible, on the one hand, and what is useful to end-users, on the other. The co-development approach, which we are following in the Blue Action project, is a particularly valuable way to facilitate this by bringing scientists and end-users together to specify, develop and produce the products that are needed. Scientists have an important role to play in tailoring and translating the available climate data into information, but ultimately the design process is a collaborative one. In a well-known article from the 1990s, the meteorologist Allan Murphy argued that a good forecast is one that is used to make decisions. The products that have been developed thus far clearly illustrate that marine ecological forecasting is possible (e.g. Figure 2). We have yet to reach the point where marine ecological forecasts are regularly used in decision-making, but it is also clear that we have many of the pieces required in hand. Involving those that make these important decisions in the development process can help to strike the balance between what is feasible and what is useful. Hopefully future generations will come to see a fish-forecast as something a little less fanciful.